I was able to get a bunch of ears of corn from a farmers market recently, and we had a stash of potatoes that would have allowed us to survive an apocalyptic event. 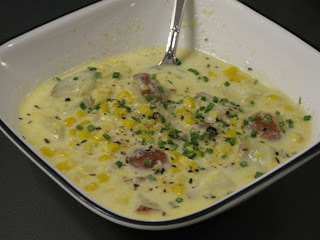 So we sought out the basis for a recipe, and we found one in a recent issue of Cooking Light for Grilled Corn and Potato Chowder. 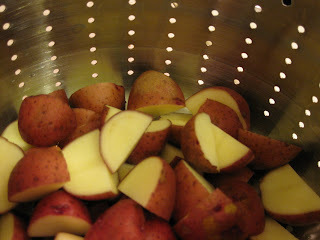 We started by taking the potatoes boiling them in water. Then we cut them into about 1-inch sized pieces. While the potatoes are cooking, we turned to the corn. We shucked it and then scrubbed off the excess silk. Then we took a bit of melted butter and rubbed it over the corn. 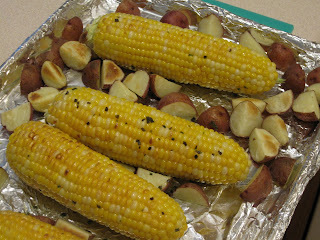 I put the corn and potatoes on a foil-lined baking sheet and put them under our broiler for about 3 minutes. 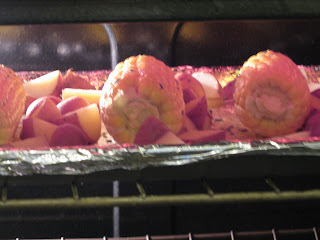 After that, we rotated the corn and potatoes and put back under the broiler for about another 3 minutes. 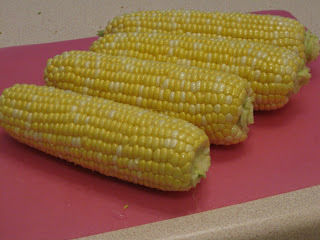 After the corn and potatoes have cooled, cut the corn off the cob. Take about 1 cup of the corn and run it through a food processor. Then, in a pan, melt a bit more butter and saute some onions for about 3 minutes. 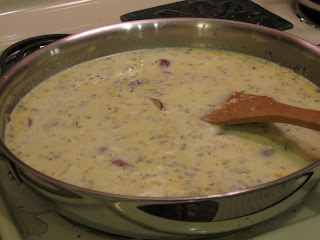 Add some salt and pepper, then throw in the potatoes and the non-pureed and pureed corn. It's also time to add some milk and bring to a boil. Then reduce the heat and simmer for about 20 minutes. This hearty recipe was a great seasonal dish that helped us use up our surplus of corn and potatoes. It was a bit rustic, with the nicely sized chunks of potatoes (although Melissa liked the size a bit smaller). And the milk brought a great richness. I would have preferred to have a bit more heat in the dish, but it was definitely delicious without it.